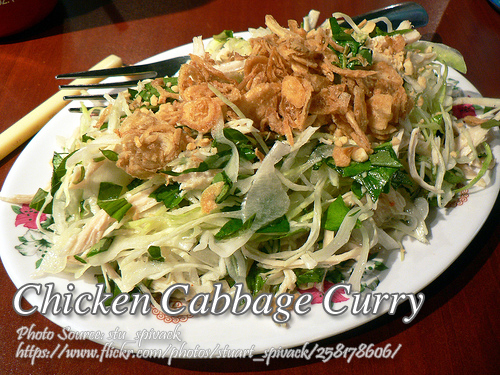 This is a simple curry dish of composed of shredded chicken and cabbage that is easy to cook. To those who don’t like to eat red meat like pork or beef, this is actually a healthy dish because the amount of vegetables is more than that of the chicken. And the cooking method doesn’t involve frying so it is a healthy dish. Since the chicken is precooked before proceeding with the recipe, you can either boil the chicken first or fry it if that is your choice. To cook chicken cabbage curry; Drop shredded cabbage in boiling water with a little salt. Put off heat. After 3 minutes, drain. Set aside. Combine flour, salt, pepper, and curry powder. Melt butter in low heat and add flour mixture. Stir. When well blended, gradually add water and continue stirring until mixture is smooth. Add milk. Stir until smooth and thickened. Add MSG. Spread drained cabbage on plate. Make a hollow in the middle and pour the mixture and the cooked chicken. Drop shredded cabbage in boiling water with a little salt. Put off heat. After 3 minutes, drain. Set aside. Combine flour, salt, pepper, and curry powder. Melt butter in low heat and add flour mixture. Stir. When well blended, gradually add water and continue stirring until mixture is smooth. Add milk. Stir until smooth and thickened. Add MSG. Spread drained cabbage on plate. Make a hollow in the middle and pour the mixture and the cooked chicken. Serve hot.